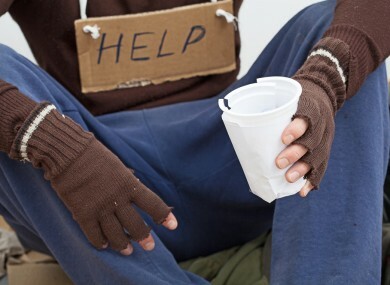 The Restaurants Association said homelessness and aggressive begging are two separate issues. THE RESTAURANTS ASSOCIATION of Ireland has said homeless people are not the intended targets of a survey on aggressive begging it released earlier today. The association’s survey, conducted by Behaviour and Attitudes, found 58% of people feel intimidated by people who look for money and beg on the street and nine out of ten view aggressive begging as having a negative impact on the attractiveness of Dublin city. This research comes two days after the body of a homeless man was found just yards from Leinster House. Chief Executive of the association, Adrian Cummins, told TheJournal.ie that he acknowledged it is a “sensitive issue and a time of sensitivity”, but that aggressive begging is a “different issue to passive begging and homelessness”. He said he could see why people might say the release of the survey was bad timing but the association was appearing before the Oireachtas Justice Committee this morning to speak about the issue and that is why it was done today. “We will welcome anything that is done with homelesness and a lot of restaurant owners would support charities around homelessness,” Cummins commented. However he stressed the issue of aggressive begging needs to be tackled, adding that an increased garda presence in the city would go a long way towards reducing this. Email “Restaurant owners say they're not targeting homeless with begging survey”. Feedback on “Restaurant owners say they're not targeting homeless with begging survey”.